New speakers and time to kill: good enough reasons to start a three-hour flick. Maybe I should have known, or at least anticipated it, but the Omaha beach scene took me by surprise. There is almost no conversation, hardly any sound besides the steady rattle of gunfire and the soldiers’ occasional supplications to God. It relies on visual intensity, with such unforgettable images as a man with exposed intestines crying for his mother, a mutilated soldier dragging his detached arm, and a bloody sea lapping against a corpse-laden shore. Barely twenty minutes into the film, and tears had already stung my eyes. It was disturbing enough to begin with, but what made it more affecting is the fact that it really happened—obviously not in the same way but in just as devastating a manner nonetheless. Directed by Steven Spielberg, the movie follows a group of eight soldiers commissioned to execute an unusual order. 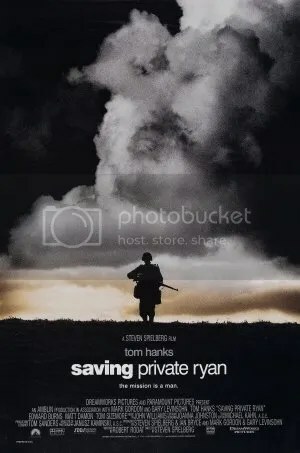 Led by Captain Miller (Tom Hanks), they seek out the youngest of four Ryan siblings (Matt Damon), a private whom circumstance has deemed deserving of a safe journey home. Amid the chaos of World War II, the soldiers fight for mutual survival, and on their way to completing their mission discover that something more than fate binds them together. Although Saving Private Ryan presents a set of realistic battlefields, the real spectacle lies in the acting. Matt Damon is competent enough, but Tom Hanks gives a stunning performance, bringing to life an enigmatic leader who inspires respect from his men. Other actors also portrayed their roles well, in a way that seemed natural yet convincing enough to set them apart as individuals (Jackson the marksman is my favorite). Because of this, (the end of) their lives mattered beyond statistics: they weren’t just numbers to be counted or names to be sent along with a thousand other death notices. For war is a private affair: it shatters the individual and foments personal hatred, even against a latent awareness that both sides are only victims of a larger violence. I do not want to spoil the ending, but at some point I became desperate for salvation, and although I did feel some disappointment at the deus ex machina aspect of it, mostly I felt relieved. I had grown so attached to the characters that I craved a happy ending. This entry was posted in Action, Drama, Film, War and tagged Matt Damon, Saving Private Ryan, Steven Spielberg, Tom Hanks on February 17, 2011 by Michelle.